A fantastic battle ranged throughout this level. Charred and smashed bodies lie in the main hallway and throughout the rooms. Most of them show some strange accumulation of earth: crystal growths, stone nodules, and the like. All the beds and tables have been smashed throughout. Pictograph carvings lined with crystal in the walls give instructions for bonding to earth at one of the summoning circles. The door to the southeast bedroom has been magically sealed. Only an order key will open it. Within is Hieronymus’ library collection from the rest of the tower. Well f*** me with a Hedge thorn! They just kept coming but I think I got them all. I think the earth mages never fled, but somehow bonded themselves to the earth to stay behind as guardians. They… weren’t rational about it. I’m not sure they could even still speak. This is insane. I’m moving on. You didn’t get all of them. I got the rest. They were like zombies that used earth magic. I found and destroyed the ritual that did this to them. It was supposed to grant them agelessness and imperviousness to harm, perhaps as one last risky attempt to win the war. It worked, to a point, but I suspect they didn’t expect it to destroy their intellect. I can’t abide the idea of anyone else doing this to themselves or someone else. I’ve put the rest of the secrets of this tower in the southeast. Use your key. Earth supports and nourishes. This cantrip allows the caster to fortify loose earth, hardening it or increasing its nourishing capabilities to life. The hardening application causes a cube of earth up to five feet on a side to calcify, gaining the strength of sandstone. This can be used to slowly mold loose earth or sand into a freestanding sculpture, make mud easy to walk upon, hold back floodwater, or shore up a tunnel or sapping. The caster may take a -3 penalty for each additional cube to be affected per round. The effect lasts until the affected earth takes a meaningful impact, change in pressure, or change in humidity (i.e., it can last indefinitely if nothing would upset the chemicals bonds created in the soil). The nourishing application draws lifegiving nutrients to the top of soil. This application is maintained, and can be sustained even while sleeping (but precludes other magic that requires concentration). A single living individual heals at double the normal rate while sleeping partially buried in this soil (and this can also repair damage to plants). The caster may take a -3 penalty for each additional target to affect. This contains the compiled higher level spells that Hieronymus took from Salome’s folios. The lower-level spells may still be available in the upper levels. The deepest floor of the tower is heavily warded and organically carved from earth and stone. Unless otherwise noted, all walls, ceilings, and floors are smooth granite traced with endless glyphs of quartz that glimmer enough to produce low light throughout each room of the complex. The ceiling of each room is at least 20 feet high, leaving room to maneuver for even the tallest of prisoners. The sphinx, Taheret, is responsible for guarding this floor. However, based upon her contract, she’s pretty sure that simply destroying most or all of the inhabitants is enough for her to get out of her contract. While she’s not allowed to attack them herself unless they try to escape, she is simply tasked with keeping them from escaping and doesn’t have to prevent invaders from killing them or stealing. She knows what’s in every room, and might help by giving answers and bargaining for additional assistance. However, she can’t help but talk in riddles, because she’s very, very bored. The room has powerful winds set up to blow into the northwest corner. Non-flying creatures must succeed at a Strength (Athletics) check each round at +5 to avoid being moved into the corner; flying creatures must make the check at -5. At the end of the round, any creature within 10 feet of the northwest corner takes 1d6 cold damage. This room was used to hide any treasures that couldn’t be taken away. It contains miscellaneous ancient art furnishings (too bulky to move easily) worth 2,000 sp for pure material value, and potentially worth up to three times that to collectors of ancient Imperial art. A cow bound to an earth spirit in the same way as the proto-trolls, this poor beast has suffered for over a thousand years as the trolls used it as their primary source of food: ripping off hunks of beef and letting the cow regenerate. The cow wears a Nosering of Sustenance (4 charges) which is sufficient for the cow to be fed and continue serving as a food source for others, and seems to have been designed for this purpose. It’s unclear what kind of effect eating the cow’s meat would have on humans. The cow is long-adjusted to its lot in life, and quite docile. It suffers the same difficulties moving through dead magic and sunlight as the trolls (it has 20 HP). Summoned from a foreign star, this immortal tangle of thin, tentacle-like eyestalks travels by floating in the air, but must remain within a few feet of a solid surface or water. It is slightly larger than a man, and it can reform its mass to attack or manipulate items. Though indefinitely cruel, its intelligence is inscrutable to humans; it cannot be commanded nor does it try to communicate. Formed of cast-off plates of armor in various ancient styles, these creatures are created from fallen warriors. Not exactly a ghost, the spirit that animates it is much closer to an elemental of the astral plane: the idea of armored combat itself. They proved difficult to command on the battlefield in the best of times, and especially hard to keep idle while waiting for battle. When used, they were typically stored apart from others and deployed as close to the enemy line as possible. Hybrid elementals of air and fire, the process that created these creatures accidentally tapped the demonic realms: in addition to looking very demonic, the creatures proved malicious and impossible to trust to not attack their own allies. They appear as man-sized demonic figures made of smoke and shadow. Defeated belkers congeal into fist-sized smoky gems useful in rituals related to air and fire, and worth 50 sp each. Forged of brass and nearly twenty feet tall, this warrior sculpture has been bound with a fire elemental and ancient arts of golem making to be a powerful protector. Due to the fire of their construction, the scroll that animates a brass golem will often become singed through use, causing the creature’s behavior to become erratic an no longer useful in war. When defeated, much of the brass can be salvaged, producing at least 1000 pounds of scrap brass (easily worth 3 sp per pound). Evil spacefaring creatures from a distant star, these man-shaped insectoid creatures are so wrong that most thinking people have trouble looking at one directly or comprehending what they are seeing (making them very difficult to hit). While seldom summoned directly, they may simply appear, inscrutibly, on worlds that have contacted foreign stars. Immortal and ineffable, they are content to wait for the stars to be right. Small, scorpion-shaped arrangements of crystal, these earth elementals aggressively seek out gems to form into new crysmals. Annoyingly aggressive, the ancients kept them essentially as truffle pigs for valuable stones. They can normally burrow easily through earth and stone, but cannot easily penetrate metal. Immortal, they do not need to eat, and will wait endlessly for an opportunity to continue their burrowing. Complete jerks from the plane of Fire, Efreeti can grant wishes, delight in perverting the wish as much as possible. If thwarted, they are quick to attack, but also willing to accept surrender and continue negotiations. There is no greater threat than a twelve-foot tall genie on its last wish. Perhaps the most tameable of demons, these big fiery dogs are sometimes kept for their uses in detecting spirits. Immortal and cruel like their progenitors, they can be an unfortunate surprise in ancient buildings in which they were previously penned. Bizarre air elementals, mihstu appear as clouds of mist that, upon closer inspection, is made up of razor-sharp shards of glass. Not filling much more space than a human, they can contort into many different shapes, easily escaping non-warded confinement. When they can be commanded, they make excellent strikers, as they can fly to wherever they want in a battlefield, with little worry about ranged attacks. Their targets are only fortunate that they do not have ranged attacks of their own. When killed, the dust wrapped up in a mihstu falls into a powder useful in rituals and worth 100 sp. Formed by binding an earth elemental to a volunteering warrior, the hybrid creature so created was not what anyone expected. Mutated and distended by the process, they proved to be ageless and immortal as long as they remained fed. However, they also proved irrational, vicious, and no longer capable of voluntarily following the orders of their previous commanders. Even more of a problem, the binding left them strangely vulnerable to disruption: fire, acid, lack of magic, and even sunlight could upset their regenerative abilities and cause them to calcify. The most docile of them were bred, eventually losing some of their greater weaknesses and making the modern troll, but pockets of the proto-trolls still live as long as they have access to food. Originally a stone or clay golem that was repaired too many times, this golem has reached a failure state where it is simply a vaguely man-shaped, ten-foot-tall pile of sand held together only by magic. This has some interesting effects on its fighting ability, as it is already shattered and can simply grab onto melee weapons. Unfortunately, it also loses a lot of its programming, and most of these eventually become as much a danger to their creators as to their intended targets. When defeated, the golem collapses into around 2,000 pounds of magically-infused sand, which might go for as much as 1 sp per pound to the right mage. Denizens of a distant faerie dimension, sphinxes are often summoned to the earth for use as immortal guardians. While they enjoy eating, they do not need to do so to maintain their lives as long as they continue to fulfill their contracted role. Their intellect is capacious, they can easily learn any language, and they often entertain themselves through the long interludes in their guardianships by planning riddles for the next people they meet. While their catlike natures make them seem somewhat cruel, they are able to be negotiated with, particularly by adventurers that might be able to end their contract and free them. Each wall is almost as smooth as glass, and the floors not much more textured such that walking is slightly dangerous (it’s unclear whether this was from a thousand years of erosion, or an intentional polish). Any art on the walls has long since eroded to nothing. Explorers do not get the sense that there was much furniture here to begin with, and any there was has long melted into a faint organic film in the corners of the rooms. Perhaps the only other thing of interest is the room with two doors immediately east of the stairs: some ancient mechanism still causes cold water to shower from several holes in the ceiling (and into drains in the floor). It’s easy to come to the conclusion that these were a spartan people, concerned with cleanliness and purification. Various toiletries, some monogrammed with an S are piled up in the southwest corner and suffering over a decade of water damage (Salome set up here for her own hygiene). It has been some time since a new class of students entered these halls, and I’m afraid the accommodations are more sparse than usual. You may take your pick of the smaller, central rooms, as they are all unclaimed at present. You should check on the other floors to see if there is any bedding in the stores. Once you are settled in, I can guide you through the rites of binding to water. With that, he steps back, taking up a position immediately east of the stairs up, out of the way of traffic. He seems perfectly relaxed to stand like a statue forever. The elemental servant can walk them through water bonding. Any other information he can provide is up to the GM’s discretion. Water dissolves and cleanses. This cantrip allows the caster to cleanse a surface as if by clean water. The normal application causes a touched surface of up to approximately a square five feet on a side (or the skin of a grown human) to be cleansed as if run under swiftly flowing clean water. The cantrip can be sustained (doing so makes it impossible to cast new cantrips, spells, or rituals, or maintain any existing effects that require major concentration), and every round the apparent time submerged is equal to a minute. This process quickly cleans wounds and grime away from a surface, and eventually begins to break down a surface that’s vulnerable to exposure. By taking a penalty to the casting roll, the caster may increase the effective “speed” of the flow. With a -3 penalty, even round is an hour, with -6, each is a day, and with -9, each is a year: at the maximum power, iron can be ruined in minutes and hard stone scoured away in hours. The caster may intuitively shape the affected area to deliberately sculpt it through erosion. The third basement is far down enough that it’s probably level with the lower city that surrounds the hill, and thus the small lake inside is probably an offshoot of the nearby river. Rivulets of water stream down the back wall, glistening in the mage lights arranged around the walls in flowing geometric patterns, and likely running from the drains in the showers above. The lake itself has mage lights along the bottom, and is crystal clear (and about ten feet deep). Some fish swim in the water, but there are also other strange ripples and those with supernatural senses detect a presence in the water (it’s a water elemental, if they’ve encountered similar before). Something is keeping the lake clean and preventing bugs from entering the tower from here. 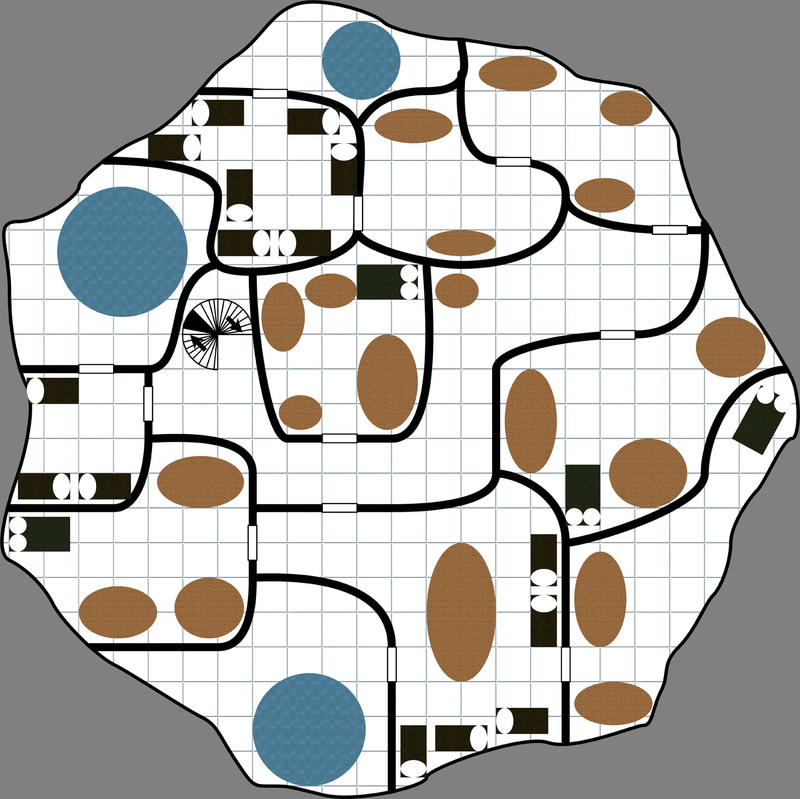 They can see a tunnel set into the northern wall, with a gridded gate set into it, that might be another way to access the tower if they wanted to swim underwater for a decent distance (and brave the possible elemental guardian). The walls to the south are set with mosaics that haven’t deteriorated significantly, showing individuals in various poses that look like they’re dancing? The one door out of the room to the south opens easily, and mostly seems to be designed to cut some of the moisture. 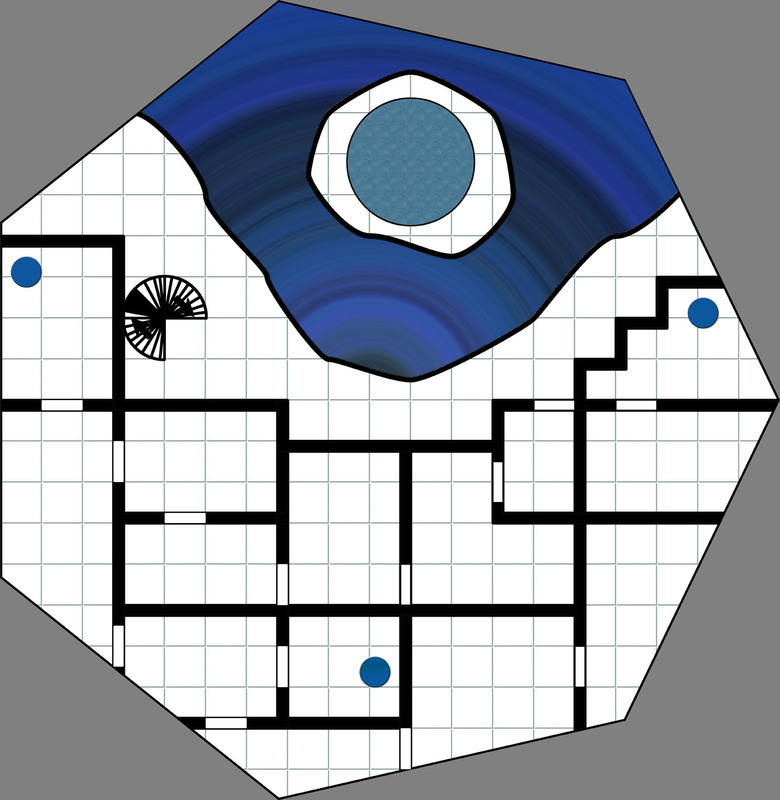 Inside, the walls are made of silver-backed glass, and may be the best mirror any of the PCs have seen (depending on campaign technology level), creating a seemingly infinite space (lit by magelights on the ceiling). Various blue gems are mounted at seemingly random places around the room (in the mirrors) at anywhere from waist to shoulder height. The door to the southwest is locked with no obvious method to open it. Any monks or other martial artists in the party can recognize the dance on the wall and the position of the gems as a martial kata. They are capable of learning and performing it, different parts of the kata taking hands and feet past specific gems in the room, triggered in sequence as a combination lock for the inner door. Less martial but more intellectual characters can probably eventually figure it out, and open it like a traditional combination lock without actually doing a kata. The rooms of this level are an ongoing purification ritual, becoming progressively harder and netting greater rewards. After steps 4 and 6 there are water orbs to touch to end the ritual and take the bonuses already accumulated. The rites must be started again to proceed further after using one of these orbs (the orb returns the user to the main room). The final room is an orb that triggers completion of the ritual. Touching a water orb after doing some basic rites is also key to attuning to water, so anyone that wants this attunement must make it through at least the first four rooms of this challenge. This room contains several of the greatest enemies of those in the room, bound, gagged, and kneeling. The targets are helpless, and damage dealt to them is taken by the attacker after a two round delay. You can simply proceed through the next door at any time. Passing this challenge purifies any mental effects upon triggering a water orb. This room contains a mask of comedy and a mask of tragedy at the end of the room. Those in the room experience a series of emotions (sadness, joy, anger, hilarity, shame, pride) and one mask lights up (the emotion is always wrong for the mask). The challenge is to put on the proper face for the lit mask, rather than what is being felt. Characters with an acting or deception skill can make a Charisma check with that skill to demonstrate the correct face, and any character can make a Will save to resist the false emotion and put on the correct face. Every failure deals the character’s level/hit dice in damage. Once all six emotions have been passed, the supplicant can move through the next door. Passing this challenge purifies any ability damage or level drain upon triggering a water orb. Do you wake with the dawn each day? Do you cleanse yourself in cold water each week? Do you keep your hands free of your private parts except when bathing? Have you lain with anyone but your current bonded lover? Have you ever failed to wear veil and gloves when touching the dead? Do you consume organ meats whenever they are offered? Every answer of No causes the face to wail and blast a line of ice at the speaker that deals the target’s level/hit dice in damage (Reflex save to avoid). The door opens once all questions have been answered either way. Passing this challenge purifies any disease or poison upon triggering a water orb. A statue in this room stands in a classic orator’s pose, straight-backed, feet planted, and hands raised. Upon mimicking the pose, the character is subjected to a barrage of uncomfortable effects designed to make it impossible to maintain the pose. The character must make six Fortitude saves. Each failed save either restarts the challenge or forces the character to take a point of damage to a random ability score (to power through the pain). Once all challenges have been passed, the door opens. Passing this challenge heals all hit point damage (including permanent damage) upon triggering a water orb. The door to the water orb starts open. Characters may use it without taking this challenge. A statue appears in this room for each individual, bent in a wrestling pose, which moves to intercept if they try to move past. Each character must succeed in two out of three Strength tests at -5 to wrestle the statue to the other end of the room and exit through the door. Passing this challenge purifies the character of fear and doubt upon triggering a water orb: for an entire turning of the moon, the character gains +5 on Will saves. A constant, cutting icy wind blows across this room, making crossing it an endurance challenge. (If the character is protected against cold, the wind adapts to a temperature or even energy type that no one is protected against.) Each character must succeed in two out of three Constitution tests at -5 to cross the room (and either touch the water orb or move on to the next room). Passing this challenge purifies the character of physical weakness upon triggering a water orb: for an entire turning of the moon, the character gains +5 on Fortitude saves. This room is full of simple puzzles games, which award tokens upon successful completion. Some cost tokens to play, risking the tokens. A sandglass begins counting down upon entering the room, providing about 20 minutes, and the door to the next room has a clear number of slots for tokens. If the glass runs out, all tokens evaporate and the glass begins the count again. Each character must succeed in two out of three Intelligence tests at -5 to work out a way to earn enough tokens to proceed. Succeeding at all three provides enough tokens to erase an ally’s failure. Upon putting tokens in the door, the character is teleported to the next room (i.e., not all have to win to proceed); the character can still go back through the door once to return to the previous water orb. Passing this challenge purifies the character of flaws in the reflexes upon triggering a water orb: for an entire turning of the moon, the character gains +5 on Reflex saves. Each character in this room receives a private vision of a mystery play, each of four individuals recounting their own version of a murder that occurred as if the character is the judge. There are a surprising variety of different stories, though repeated viewings sometimes repeat actors in different roles and situations. Each character must make three Wisdom tests at -5 to eliminate a suspect: passing all three leaves only one suspect, while each failure leaves another possible murderer. The character may then pass declare a murderer to be put to death (choosing randomly if more than one suspect hasn’t been eliminated). Choosing incorrectly results in the character taking 1d10 damage per level and restarting the challenge. Passing allows the character to move though the next door (it becomes immaterial only for the character). Passing this challenge purifies the character of ignorance upon triggering a water orb: the character can learn an additional language within a few days if study begins within the next turning of the moon. This is just a crazy room full of magical traps (choosing energy types that the targets are vulnerable to) that strike either across the midsection or in two vertical lines to narrowly miss only someone standing ramrod straight. Light-up faces on opposing walls give a clue as to whether the solution is to genuflect or stand at attention. Each character must make six Dexterity checks at -5. Each failed check results in the character taking 1d4 damage per level. Passing this challenge purifies the character of hesitation upon triggering a water orb: the character grants a permanent +1 to initiative (that stacks with previous bonuses). Each character in this room faces a gauntlet of elemental figures (the number of figures is equal to the character’s level/hit dice). The character must command them to move aside, making a Charisma check at -5 for each. On a success the figure stands aside. On a failure, it deals 2d6 damage and disappears. Bypassing each figure through success or failure without being defeated passes the challenge. This is intended to be both an insight into the strange values of the ancient empire, as well as a repeatable resource for the players to remove status effects. If I had the map to do over again, I’d probably arrange it in such a way that the PCs have a little more control over which challenges they do in which order, to focus on traits they’re good at. The difficulties and damage numbers are designed for Beyond the Wall. For other systems, the idea is basically that getting past the first four rooms should be tough but reasonable for anyone, and the subsequent rooms should be almost impossible for low-level characters but still very difficult for high-level characters. Thus, most things scale based on level (and the ability checks are based on Beyond the Wall not really increasing ability scores drastically: in other systems you may need to scale these in a different way). I had one PC make it through to the last room with only one HP remaining, after a series of extremely lucky rolls (and using up all her rerolls). She grudgingly left rather than risking getting killed in the Charisma room and cashed out her prizes, but plans to go back later. None of the other PCs even made it past the fifth room. The fourth floor is another visibility risk. Thick panes of glass or crystal seem to be worked haphazardly into windows on the tower. The panes are very thick and cloudy, making it hard to see anything outside. At night, light inside is visible from outside. The mage lights start to come up in arbitrarily arranged points, in all seven colors such that the total lighting of the room is even and white, but objects cast strange rainbow shadows. It’s not incredibly bright, but probably visible outside. 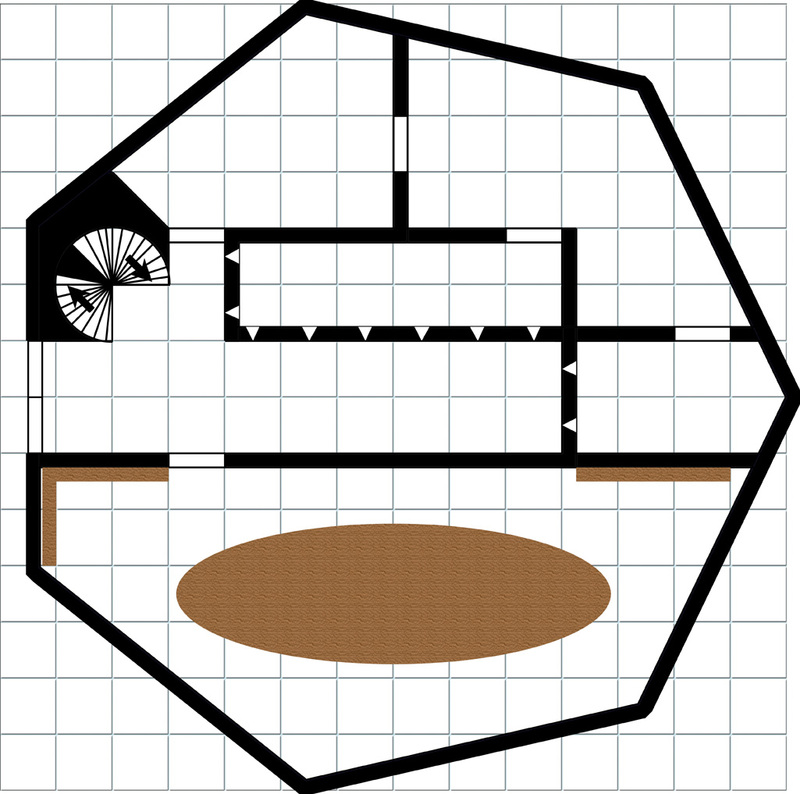 The floor wraps clockwise around some kind of central area. The shapes are seemingly random, tables that once were piled with scrolls are pushed into the corners with no obvious reason for their orientation, and even a quick glance around the corner is enough to spot a couple of small beds in a bigger nook. There are stains on the tables as if scrolls sat there for ages and then were removed; nothing obviously useful is apparent to a quick glance. It is hardly damp at all up here, so the scrolls might have survived… if they can find where the order mages carted them off to. The walls are painted in flowing, abstract rainbow colors, mostly in curls and more-or-less horizontal lines that look like currents of air. When people do the rainbow dance from below, climbing the stairs, the tones of their passing are louder up here, though not blastingly loud. Likely, the denizens would get pretty good warning of people approaching this floor from the lower one. Ducking back down the stairs cuts the lights, and spellcasters wielding a key can try different words for “darkness” in Magespeech, using a sufficiently commanding tone, to get them to turn off. The floor continues in a clockwise spiral with furniture in a largely unfathomable arrangement. Though the feather stuffing of the mattresses has long decayed into dust with the periodic preserved stems, the fabrics still retain some shape and color (though one probably wouldn’t want to sleep in them) and the frames are in remarkably good shape. Similarly, all the tables are mostly intact. A good blow could probably shatter the ancient wood, but at least it’s not already rotted into powder. There might be treasure to be found by digging through the furniture (which would probably take about half an hour of careful searching or 15 minutes if the party doesn’t care about destroying these artifacts of an ancient time), but nothing is immediately obvious. By the inner ring, it’s safe to light candles without fear of the light being visible. The murals of wind continue on the wall’s side that faces outward, but the wall’s side that faces the center of the tower are more pictographic. Done in an archaic style (think Egyptian tomb paintings or Bayeux Tapestry; no perspective), it seems to be pictures of mages performing some kind of ritual, possibly in the light of the oddly shaped windows on the outer wall of this floor. In the center, a large ritual circle is carved into the floor, with two smaller circles to the north and east. To magic detection, they are inactive, but still potent permanent summoning circles. The easternmost table on the inner ring contains a few hastily hand-bound folios seemingly comprised of pieces of salvaged scrolls, and a note on top in Salome’s handwriting (this one not water damaged to any meaningful extent). One folio contains a primer that explains the murals on the wall (how to attune to Air), while one contains what seems to be treatises that could be used to learn some air-related spells and rituals (up to 3rd level). Both will take some time to decipher, since they’re in a combination of Ancient Imperial and Magespeech, and would be somewhat alien to modern understanding of magic. The scrolls here were much better-preserved, but more obviously simply missing. It is likely they were the easiest to flee with. I believe the top floor was what was referred to as the Sky Road. They would use the massive circle to call up air elementals and bind them to service. With the help of the elemental and crude gliding apparati detailed in some of the scrolls, they could safely leap from the bays in the tower and travel great distances by air. I do not believe this was true flight, particularly for the more portly of magi, but they could likely travel miles for every foot they fell, and do so at great speed. A very effective way to get around indeed. This is likely how most of the remaining magi fled. As with the fire dorms, there were ample primers to assemble a completed copy of instructions of the introductory binding technique to air. Their operative understanding of air was its elasticity, and the cantrip seems to impart a way to draw in the nearby air (possibly depriving those that need it for their breath) and then release it in an explosion of wind. Not as exciting as summoning up fire, but possibly more versatile for everyday uses. Unlike the fire mages, there seem to be no hidden or locked areas, beyond the annoying puzzle to get to this level. I believe I’ll check below next. Of all the cantrips, this one sounds the most useful. I believe I will learn it, and ideally pass it on to others in the Order. It could be incredibly useful for certain problems of mechanical optimization. As with the previous floor, I will store the more advanced texts in the library room I have cleared below. I don’t know what Salome was thinking, simply leaving such things lying around. Air is elastic and compressible. This cantrip allows the caster to attract nearby air and compress it into a small orb, then release it slowly or explosively. This can starve air from a sealed room, save air for a trip underwater, knock back a target, or propel a projectile. The caster can only maintain a single orb of air at a time, and doing so makes it impossible to cast new cantrips, spells, or rituals, or maintain any existing effects that require major concentration. The normal application saves enough air to empty a cube five feet on a side, provide eight hours of breathing, force a target to save or be knocked down or back, or provide standard damage to a projectile. The cantrip can be cast and thrown at a target as a single action, but all other actions require the cantrip to be cast on one round and then used for other purposes on the next (e.g., one round to cast and load a firearm, then the next to fire it). By taking a penalty to the casting roll, the caster may compress more air. For each -3 penalty, the caster empties an additional five-foot cube, which provides an extra eight hours of breath, or +1d6 damage (either from a projectile or if the target of a knockback impacts a wall). The top floor is completely open, with just corner pillars to hold up the roof. At nighttime, the party might have to shout down the mage lights again, because there aren’t really even walls: there’s a faint distortion in the air that seems to be the tower’s defensive field (and which had let neither bugs nor climbers in for a thousand years), but air flows freely and one can easily see city below. A massive summoning circle is set into the middle of the floor, and ancient empty tables are haphazardly spread out and empty, save for scraps of leather, softwood, and fabric that might have once been gliders. The mage lights, if not shut off, are on the ceiling, mimicking stars. This ritual circle makes it very easy to call up air elementals. The walls are permeable walls of force, which permit air to flow both ways and allow people to leave and attack from inside, but block travel from outside. There is no roof access, though an enterprising climber or flyer could leave and climb to its flat top. There is nothing of note up there (save perhaps some nesting birds), and leaving makes it impossible to get back in without going back down to the bottom of the tower (hopefully there are still friends inside who can lower a rope). The first basement is even more humid than the entry floor. It appears to be the dining hall and kitchens. Everything organic and steel has turned to damp dust, and the party can make out the shadows of once-giant tables in the detritus on the floor. It may not have been large enough for everyone from the tower to eat here at once, but certainly in shifts. Side rooms were likely staff dining or meeting rooms, or maybe they had preferred seating for top students? The southeast room has some plumbing and holes in the floor, so may have been a large bathroom (which is convenient to meals but maybe not the most convenient for students on other floors). Of the large kitchen, all that remains is a stone hearth and island with inset basins for cleaning, as well as shattered shards of pottery plates, mugs, and bowls in the dust off what must have once been cabinets. Searching through the remains, the party can find 75 sp worth of miscellaneous silverware, bent and tarnished. They don’t add up to sets and there’s not a lot of them, so likely someone looted the silver already (either during the flight, or one of the order mages) and this is all that went undiscovered. In the Northeast dining room, someone managed to assemble a table from scraps and close the doors against the damp. A few decade+ old bags contain food that has long deteriorated and camping supplies that aren’t particular upgrades to the party’s own (and are also beginning to succumb to the damp). This seems to be where one of the order mages set up a command center. A couple of letters in a pack look to have been unsealed, read, and then refolded sufficiently to survive without significant water damage. I appreciate the research you sent along regarding the water magics you’ve uncovered in the tower. It does sound like their conception of the uses of water are much closer to what we’d consider the more active uses of abjuration magic. It’s interesting that they saw it as a cleansing, scouring force rather than a source of sustenance. Perhaps they assigned the source of healing and life to the earth, which would track given their rather nonchalant use of necromancy: if you’re used to covering people with earth to heal them, it’s probably less inherently offputting to summon the dead forth from their graves. Unfortunately, even though I’m now safely ensconced in nearby Heimbach, I do not believe that I can spare the time to help you research physically at the tower. I see a lot of potential in the baron’s second son, and hope to confirm that he has the gift and ease him into training early. As you well know, the children of the nobility can be difficult students if taken after they have a sense of their own importance. In fact, the town itself seems to be a confluence almost as interesting as the tower. We have fae foundlings taken in by the locals, motherless babes delivered to town by close-lipped warriors from the north, a golden-haired child that seems destined for greatness, twin scamps fostered from a storied line of nobles, and whatever secretive plans the old witch in the town has cooked up. I suspect in a decade or two, you may start hearing interesting things from this town. Feel free to continue to send me correspondence as needed, and you’re, of course, welcome to stop by Heimbach if you’d like in-person counsel. If you have a current address for Lazarus, he could likely assist with the earth magics. I believe Judith retains her long practice of wintering in Grebenau, and her divinations would likely be of great use to you. The next time Magdalena passes through for a… visit… I’ll see if she has any insights. You would also do well to correspond with Hieronymus. He can receive mail via the Zedlitz, from whom he rents a tower. His research into transmutation may be relevant to correspondences between elements, and he’s a shrewd organizer of research. Regardless of the fact that you have not yet encountered anything more than passive security in the tower, I must caution you in the strongest of terms not to enter the earth mages’ basement without significant assistance. From what you sent me, their conception of earth is not just a healing, nourishing force, but one of containment. I suspect it’s very likely that if there are any active threats remaining in that building, they will be locked away beneath the earth. Not once in our association have you ever listened to my advice, but please listen now. I have set up a place in Overath, and am even now assembling a party to investigate the cursed city to the north. Come. Lend your evocations to our mission, and I will then lend you my own expertise and the might of my allies to investigate the tower. The second floor is pitch black, with no mage lights turning on on entry save for very dim crystals around the walls, enough to see where to walk. 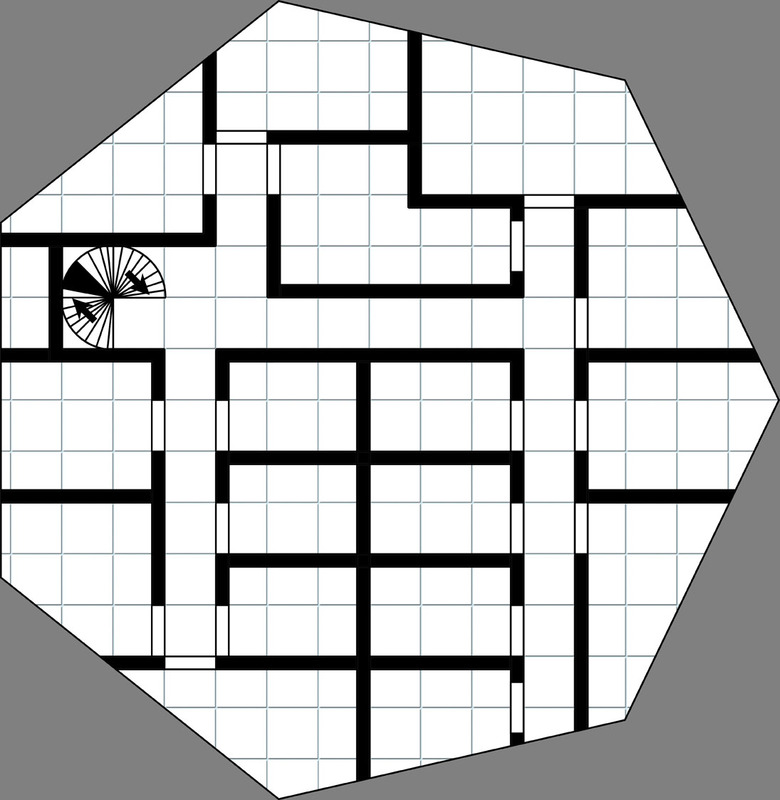 This may be a safety precaution to prevent giving away one’s position from outside, as each wall section has four arrow loops to the outside, likely for defense of the tower. The loops seem to admit air but they haven’t been an entry for bugs. Those that detect magic can see the protective magic surrounding the tower also shielding the windows, which may account for that. The rooms appear to be contained within a C walkway around the shell of the tower. 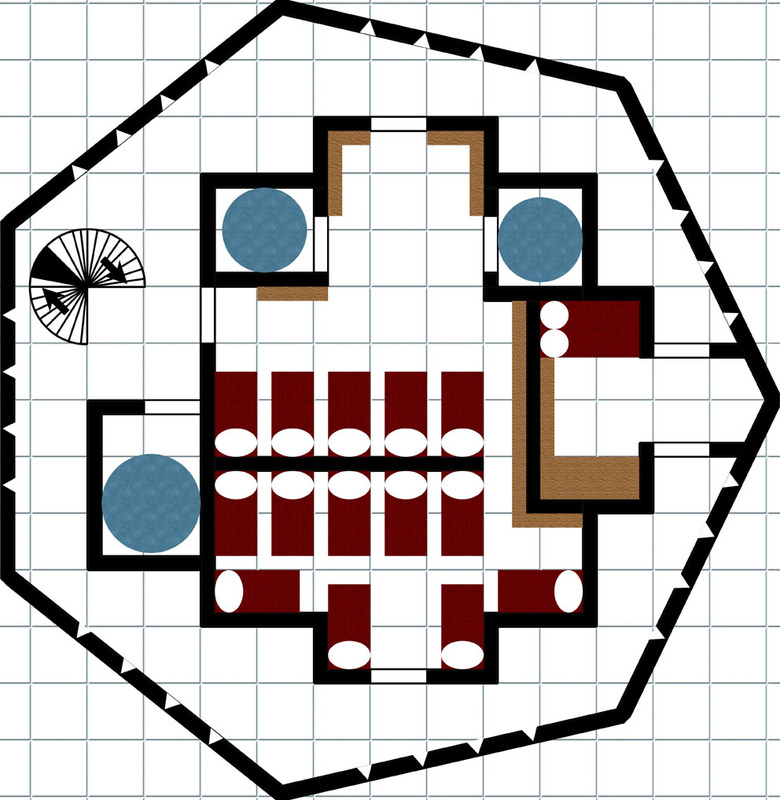 There are six doors, three of which feature a keyhole (The door to the blue summoning circle and the doors to the eastmost room). If there was any adornment of the walls accessible from here, it was all in paint rather than relief, and has long since faded to nothing. It is noticeably less humid here. A party can split up to body-block the four loops closest to whatever they’re looking at and still use a candlelight, but they will need improvised curtains for all 28 loops. If the loops are not blocked, any light sources on this level at night will be visible lighting up the tower to those outside. 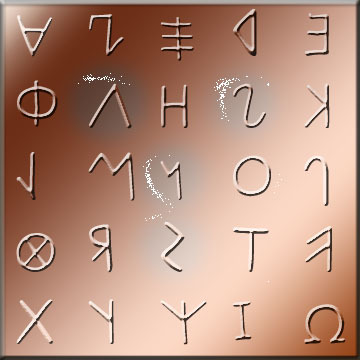 Each of the door plates is engraved with a five-by-five grid of the letters of Magespeech (i.e., whatever language your game uses for magic; mine uses a Greek alphabet but Latin-sounding words). The three doors without keyholes look like they once had some of the letters indicated in chalk, but Salome or Hieronymus’ writing has worn away in the damp over the years. Likewise, there’s some mild discoloration in the indicated letters such that they might have been frequently touched by the original inhabitants. There’s enough overlap in the remnants that a quick search can make the party pretty sure the same letters were marked on each door, but it’s possible some of the markings have faded completely (and it’s not certain what the circles were meant to indicate). This puzzle is to press the letters of the password all at one time. Pressing single letters (once or trying to spell out a password) does nothing. Pressing the wrong combination heats up the plate enough to deal 1 fire damage to the person touching. The door leads to a carefully regimented dorm room, that all three of the unkeyed doors seemed to enter from different directions. If the party pulls the door closed behind them, the mage lights come on inside (staying dark outside). The lights are in a regular grid about head height around the walls of the room. This room looks very regimented, with the remains of the student beds each lofted above a chair and table for study beneath (and high enough up that they’re shaded from the mage lights for easier sleeping). Only a few of them have crashed down from their lofts over time: the closed exterior doors seem to have cut down on the humidity significantly, so the beds and furniture are in reasonable condition for furniture that’s been in a dry environment for centuries. These beds seem to have been stuffed with a fairly course padding that’s decayed mostly to powder. Emptied scrollshelves line the walls, and above them the murals in here demonstrate students doing rituals around glowing orange-yellow orbs (the flame orbs upstairs). Two additional closed and key-locked doors (with uncircled rune panels) are across from each other to the north of the room (making a total of five doors in this floor that are locked in a different style than the one opened). Owing to the density of furniture in this room, it likely takes a full party up to an hour to ransack this room for treasure. On the bookshelf next to the west door, a stack of folios and a note from Salome sit (they are pages Salome assembled into some semblance of order from what hadn’t decayed on the level). The folios include a primer on how to attune to fire, and some lower-level fire-based spells and rituals (see the suggested spell list, later, using the level 1-3 ones). They must be deciphered from the Ancient Imperial and Magespeech. This tower was sadly not archived properly. It’s hard for me to tell which scrolls were taken as the wolf mages abandoned the tower, and which simply decayed into nothing. I have not yet found any logs of the final days here, and I am merely assuming that the tower was abandoned with some haste but never actually conquered. Perhaps the mages were given an ultimatum to leave quickly, or perhaps they simply evacuated as the city was falling rather than trying to weather a siege. From what I have seen of the kitchens, they likely relied on the city for supply, so could not have been trapped long, even with their power. It is likely there were few of them left here, anyway: while there are many beds, I cannot imagine that dozens of magi would have been left in school as the war was going against the Northern Empire. What I have found on this level, I have collected here for the Order’s later use. It is not much, and much of what remained was too ruined to read. I have tried to bind what was meaningful into codexes, and am beginning to draw some interesting conclusions. While the Order’s classification places the arts of evocation and conjuration as neighbors, the magi of old seem to have seen no practical difference between them. Particularly as the wolves of this tower seem focused on the summoning of elementals rather than beings of the fae realms, they saw the arts as merely steps in the manipulation of greater and greater energy. In particular, the first codex I’ve assembled was made from surviving text from several identical books for the apprentices. It is likely close to a complete copy of the introductory text of the fire mages, used to explain the art on the walls. It details a method to attune oneself to fire, which they conceived of as the mechanism of causing objects to release their energy to the world. I believe following these steps would instill one with a cantrip of Fire, which could be used as a bridge to understanding of the more complex texts in these books. However, the writings imply that elemental specialization was very important to their understanding of the praxis. Likely, attempting to attune to a second element would fail, or might even make it harder to use all attuned elements. I intend to look into the arts of the other floors before choosing a focus. I have not yet been able to open the other doors. The others on this floor have keys, and may have different code phrases than the dorm doors, as must the doors in the floor above. It took me some burnings to puzzle out that IGNIS must be the code for this door. Mentions in what scraps I’ve found lead me to believe that the others are likely commands in Magespeech, but I do not have the fortitude to try too many at this time. 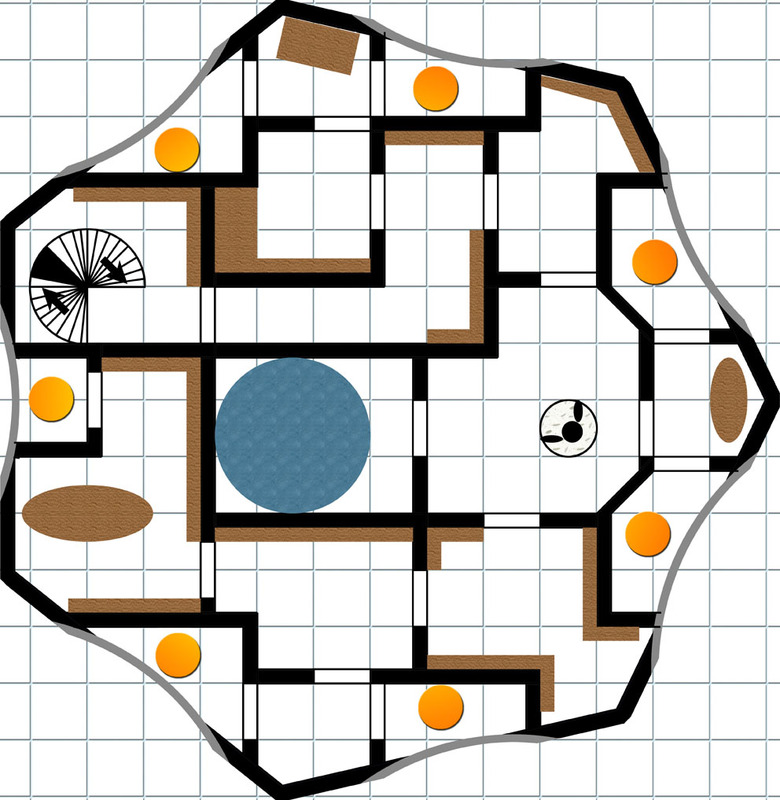 I believe that the other rooms on this floor are practice summoning chambers and possibly the Magister’s room. Those above likely lead to the fabled Flumes: legend says that this tower could blast attackers with torrents of flame from above. Even such magics could not save them against the greater physical and mystical might of the Southern Empire, it seems. I have taken some of the more advanced texts Salome left and stored them below for the time being. I would take them with me when I leave, but I must travel light and may find other treasures to walk away with. Besides… I am not sure Leberecht, my apprentice, is ready for the temptation they might provide him. Fire releases Energy. This cantrip allows the caster to cause a flammable object to burst into flame. The normal application causes heat to burst from an object that the caster touches, sufficient to instantly ignite cloth, paper, kindling, extremely dry wood, or the like. An unwilling, animate target may make a saving throw to dodge out of the way or otherwise spoil the casting. Against such a target, the effect immediately deals 1d4 fire damage, and burns for an additional 1d4 on your action every round until the target takes an action to douse the flame (or all clothing is burned away). A target can only suffer from one casting of this cantrip at a time. By taking a penalty to the casting roll, the caster may increase the intensity and/or range of the flame. For each -1 penalty, the caster may affect a subject five feet further away, simply gesturing at the intended target. For each -2 penalty, the effect can ignite more difficult materials, and the damage increases by a dice size (to a maximum penalty of -8, which deals 1d12 and can ignite green wood). This effect cannot be maintained to generate heat or melt a target over subsequent rounds: it simply sets a fire or does not, based on the flammability of the target, and subsequent burning is based on the available fuel. This larger private room contains a bed and shelves. In addition to 400 sp worth of miscellaneous art furnishings too heavy to move (worth up to three times that to a collector of ancient Imperial art), a two-gallon covered steel pot contains a flame-retardant dust that can be applied as a body-covering to provide the wearer Fire Resistance 2 for eight hours, or used to extinguish a fire it’s thrown at (up to a 5 foot square; deals 2d6 damage to a creature made of fire). Each such use requires approximately a double-handful of dust, so there are approximately 30 uses within the pot. These ornate summoning circles are embedded in the floor, and provide a bonus to attempting to summon beings from the plane of Fire. The third floor is dryer than the lower floors, and has no immediate exterior windows. The mage lights are almost blindingly bright after leaving the dimness of the previous floor. Some of the paint on the walls has survived, and they seem to be abstract murals of warm colors in shapes reminiscent of flames. The immediate door has an identical brass plate with no obvious markings as to which letters to touch, but it has been spiked open by an iron nail that shows only faint signs of rust. The entry room and hallway both feature sagging scroll shelves that appear to have been emptied rather than just deteriorating. The wear pattern indicates that some were vacant for centuries, while others might have been emptied relatively recently. The two doors at the end of the hall feature brass letter plates with no obvious clues, and no spikes. Perhaps the previous order mages never got them open. Each wall of the tower has a small room that is large enough to contain an enormous orange glass orb before an open archway. The archway is protected by a plane of force, but this does not protect against fire- or heat-based attacks. Anyone that knows the Fire Bonding Cantrip can use it to activate an orb and use it to blast a line of fire up to 300 yards away from the tower (or far enough outside the city walls to give a very bad day to a besieging army). This ray can be tuned to do 3d6 fire damage per round to a single target (Reflex save to dodge out of the way) or 1d6 fire damage per round to a 20-foot radius (Reflex half). This takes some experimentation to get right and is very visible from the ground. The orbs can also be tuned to just produce a focused beam of light that can be used to communicate visually with targets far in the distance, particularly at night. These rooms were used for communication with the rest of the Empire, and contain shelves of observations and communications that have mostly faded to illegibility. Weeks of study by someone who speaks Ancient Imperial and has a good sense of geography could uncover some details about troop movements and strongholds in the ancient Northern Empire that might give clues as to ruins and battlefields to the north. This statue appears to be a very tall wicker man, and the room is full of strange thorny growths. The statue is very dry and easily ignited by magical fire damage of at least 1d4, at which point it begins roaring from within with flame that deals 2 fire damage per round to everyone in the room. If not on fire, at the end of each round everyone within the room is attacked by the thorny growths: +5 to hit, 1d6 damage, and the attacks are Magical and Puncturing. Those meant to be in here would light the statue rather than suffer the thorns. These rooms seem little used, as there weren’t many threats from or allies to the east. The table contains a few old faded texts describing interesting celestial phenomena and cool sunrises. These rooms seem to be the focus of the defense of the kingdom, and include a mostly-preserved war room and many shelves for documentation. As with the north rooms, weeks of study with Ancient Imperial and a good map or knowledge of geography could turn up some interesting information about the final days of the war with the old Southern Empire and potential locations of battlefields and ruins. 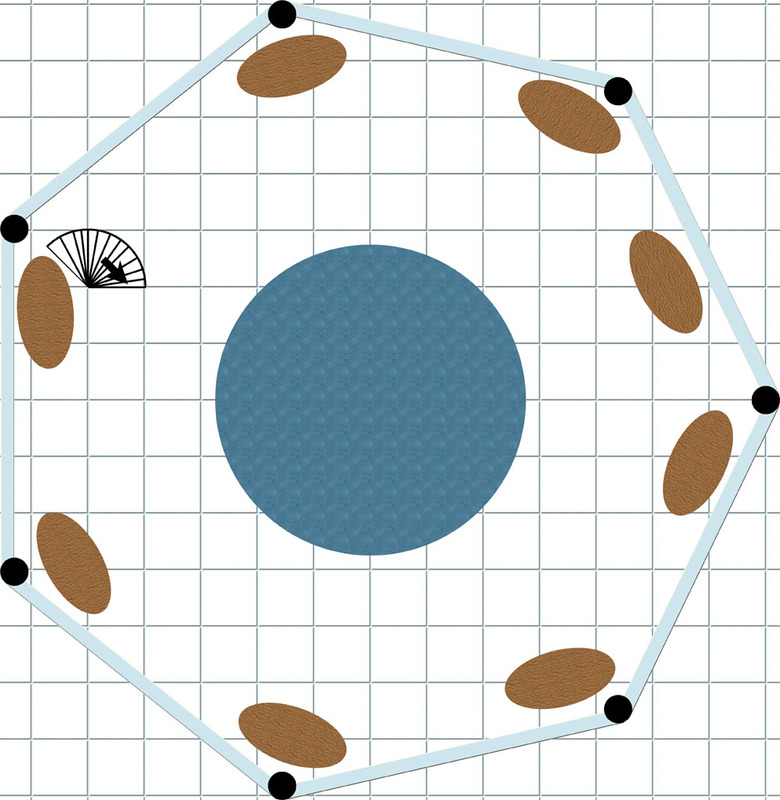 Detecting traps reveals no explicit traps. The stairs are the same stone as the tower, but painted with some kind of pigment that’s proven much more durable than whatever was on the walls. There is a faint musical note when someone steps on any stair segment. It sounds trumpety, and comes from above. 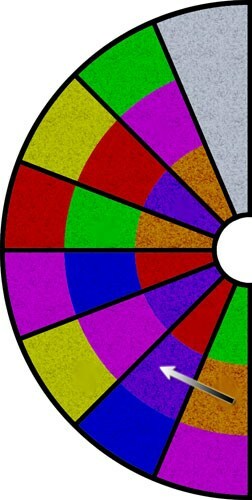 (If any of the PCs have musical training, they can identify that colors closer to red are deeper notes and those closer to violet are higher, essentially playing a musical scale from red to violet.) The sound doesn’t appear loud enough to be heard outside the tower, even in the dead of night. If anyone steps on the white stair (or tries to jump over it) without hitting the notes in the correct order, a discordant note sounds accompanied by a strong (but not especially loud) rush of air, shoving them back (i.e., why Salome had the cushions; with them decayed, the falling character takes 10 feet of falling damage without some kind of check to land softly or allies checking to catch the falling PC). To get up the stairs successfully, a climber must step on, in order, Red -> Orange -> Yellow -> Green -> Blue -> Indigo -> Violet -> White (this requires some backtracking). The rest of the stairs up don’t play notes. 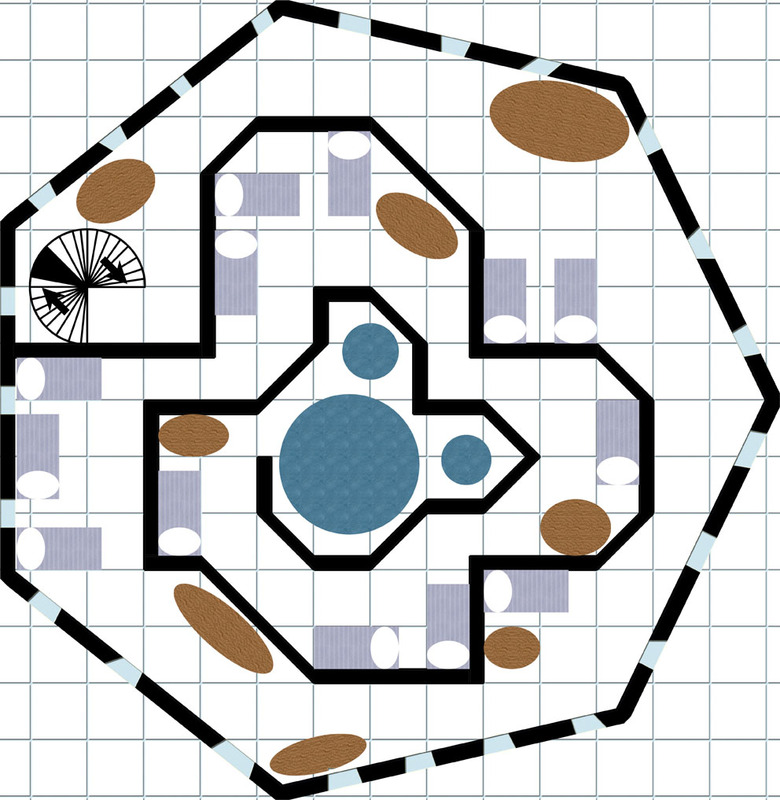 For my Beyond the Wall game, I may have gone a little overboard in designing an encounter location. Because I produced well over 10k words, I figured I might as well serialize it here so others might find use of my over-writing. I’m including conversion suggestions for people running standard D&D or Pathfinder (as well as how to hack the story to better fit as a standalone). This started out because I grabbed and E/W flipped the map for Fallcrest because I needed a city on a river that the players would investigate for what I thought would be a session or two and I didn’t want to put much work into the map. Turned out there was a lot gameable there, and it became 5+ sessions of content (as well as a lengthy play-by-email in the upper tower). One of the things on the map that didn’t make a lot of sense was the Septarch’s Tower. The city was standing in for a town in my campaign’s northern empire, which isn’t too fond of any magic beyond their own pseudo-clerical type. However, the location could easily be built on the ruins of the former empire that fell over 1,000 years ago, and they definitely had mages. So it made sense to set up the place as an ancient holdover that the locals didn’t like but couldn’t get rid of. Meanwhile, I had previously repurposed Baltron’s Beacon for an adventure in a swamp. Since that adventure features a teleportation artifact, and I was looking for a way to give my player characters an equivalent of a hearthstone ability (so they could swap out PCs between sessions without going home), I’d elaborated on the backstory. The mage that previously held the tower (renamed to Balduin to fit my campaign’s naming practices) had invented a teleportation device that worked off of large, enspelled keys. He then sent these keys to his closest wizard-type mage friends in the Order, before blowing himself up trying to finish the teleporter. At the time, this was a way to give the PCs quests to find some additional bind points: they started with two keys, which allowed them to leave one at their home base and take one with them on adventures. Having more keys would allow them to set up additional bases they could teleport to. I decided the Septarch’s Tower would be an old, Hogwarts-style mage academy for training elemental war mages for the ancient empire (it was located near their border with their rival empire). It was heavily warded, so nobody had been able to make it in for 1,000 years, including the old enemies that sacked the town. Since Balduin had been studying the magic of that empire to get his teleporter working, the keys would also work to bypass the wards on the building. And, over a decade past, a couple of his wizard friends had taken advantage of that to slip in and try to loot this ancient stronghold of knowledge. Salome was an evoker-style mage with a specialty in subterfuge and guile. She’d happened upon the tower as part of infiltrating the northern empire, and took advantage of her key letting her in. She was a bit too headstrong, and… well… her body is still in the tower from when she didn’t acknowledge she needed backup. 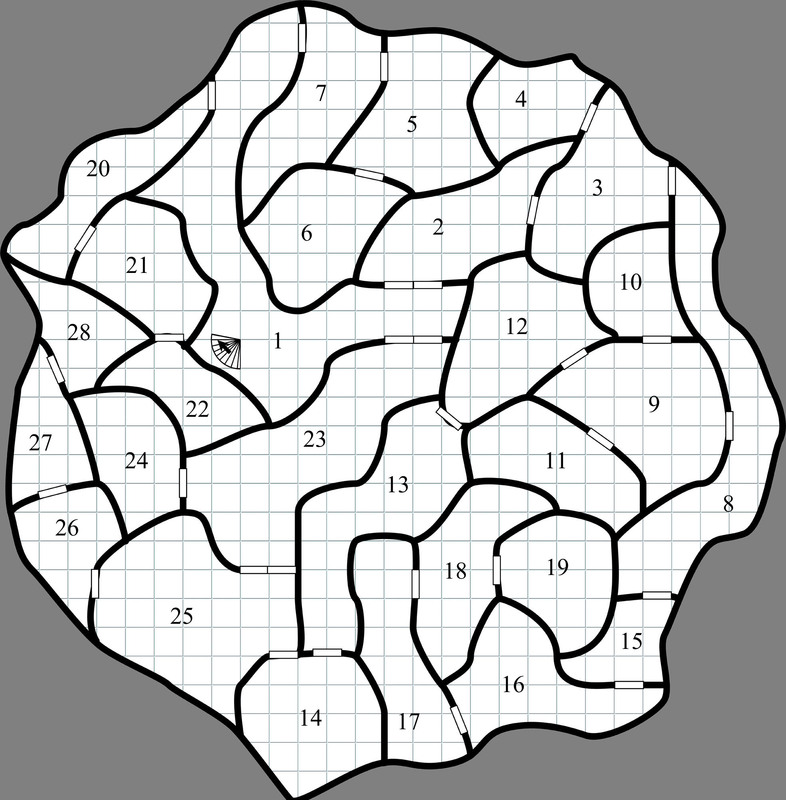 I initially ran this as a between-sessions play-by-email game for the upper parts of the tower, so I kept most of the challenges fairly simple (even simple puzzles can take forever in PbEM) and didn’t have any combat to try to get as much as possible accomplished in the month before the next live session. The lower levels were then run live, so could have more involved rolling and combat. Also note that this means that most of the text below is in a more descriptive style, as it’s only lightly edited from what I sent to my players as they entered various areas. If you’re running this live, I would add more creatures to the upper rooms (which are currently entirely safe except for some puzzles that deliver shocks for getting the wrong answers). Particularly as a standalone, it would be very easy to have Leberecht (Hieronymus’ apprentice) and his running crew here instead, spread out researching various parts of the tower and eager to attack anyone else after their prize. In that case, most obvious treasure has probably been consolidated in wherever they’ve set up shop (likely an upper level), and some of the dorm rooms have probably been slightly repaired to serve as camps for various research teams. Obviously, replace the verbiage and history to something that makes sense for an ancient sealed elementalist’s tower in your campaign. Beyond the Wall uses a silver piece standard, rather than a gold piece. You may want to update the treasure to match (and, honestly, to fit whatever the recommended treasure is for your game and party level). The entire tower is in the same meticulous stonework as other ruins of the old Northern Empire. This has held up much better than many of the other Northern ruins the party is likely to have encountered, and particularly well for the town. Those with the ability to detect magic sense that this is because of protective magics worked into the stone that are still holding strong. It’s around 100 feet tall, and the walls are a regular septagon with perhaps only a slight taper going up. Around 25 feet up, each wall face has a set of four evenly-spaced arrow loops. At about 50 feet up, each face has a large, ornate arch (the titular seven arches) that seem to lead into a small room and shimmer as if glassed in. Near the top of the tower, one level has irregularly-placed glass windows, and the level above that seems to be completely open to the air, the roof of the tower supported on pillars in the corners (though, again, a shimmer indicates that perhaps it is covered with windows larger than seems possible). Once you enter, mage lights begin to appear from crystals embedded in the walls, casting the area into a faint blue glow (dim lighting). It’s likely that whatever powers them is beginning to weaken. Though the stones appear to have been protected by magics, little else has. The air is damp, and that moisture seems to have ruined most organic and ferrous things within the tower. Even from the entryway, it looks like there might have been shelves and cloakracks that are now little more than piles of detritus where they once stood. The ceiling is high (and will continue to be high on other floors, unless otherwise noted): perhaps as tall as 20 feet. Which makes the narrow spiral stairway to your left upon entry an imposing climb. It curves up clockwise and down counterclockwise. It, fortunately, seems to be part of the stonework and still in good repair. The hallway ahead of you seems to dead end, but it does not take long to realize that several of the vertical reliefs within the murals are poor concealment for arrow (magic?) loops that widen on the other side (perhaps, when painted, they were better hidden). The rooms beyond are not lit, but anyone with low-light vision or who lights a torch or lamp can get close and scan through, seeing two small guardrooms where defenders could likely hold out against invaders. Each has a door to the north. From the hallway, other than the stairs there is a door north and a door south. These doors (and, indeed, most doors in the complex) appear to be steel-banded thick wood, that no doubt is spelled along with the tower (or it would have long rotted away). They have no handles, but do feature brass touch plates where a handle would otherwise be. A parchment letter sits upon the stairs up, weighted down by a rock. It appears old, and has suffered extensive water damage. There are two sets of handwriting, the the lower set appears slightly less damaged. Balduin, I don’t know if your key will ever work to teleport, but you indeed managed to attune it correctly to the old imperial magics. Which I suppose you know if you’re reading this. I’m investigating the tower, and have left notes as I go in case I’m out when you arrive. Be careful in town: the new empire is only getting more bold, and the city is already unsafe for mages of the Order. I believe Balduin is dead, and I fear Salome might be as well. I’ve heard from neither in years. Anyone else that follows, be careful. I’m investigating the tower as well. The doors in the level don’t appear to be mystically sealed. They’re on a vertical pivot opposite the push plate, and seem to be designed to swing in either direction. This is a style that isn’t much used, possibly because of the difficulty of preventing a draft, which may explain why there’s so much moisture damage in the tower. Perhaps long ago some magic actually sealed the airflow through doors. The doors are only slightly swollen, so it takes a little work to shove the doors open. It’s likely Salome and/or Hieronymus did some work to unseal them whenever they were here, and they’ve swollen less in decades than in centuries. To the north, the door has triple brackets to bar the door from within, which gives credence to perhaps these never being mystically sealed, or at least the mystical seals weren’t strong enough to rely upon. The room appears to have been, indeed, a guardroom. Corroded ruins of weapon racks slump against the walls, and the lights in here cluster around the door, perhaps to give defenders some advantage of being in shadow. A couple of what might have once been spears seem to have had silvered heads (might be able to salvage 20 sp worth of value from the tarnished material). East of the guardroom appears to have been the guards’ office. There are stains on the floor that indicate chairs, desks, or perhaps even cots were once in the room for guards on duty, but there’s only a few bits of organic goo left. Likely, Salome or Hieronymus cleaned it up out of disgust. The doors in here lead to the chambers with the arrow loops. 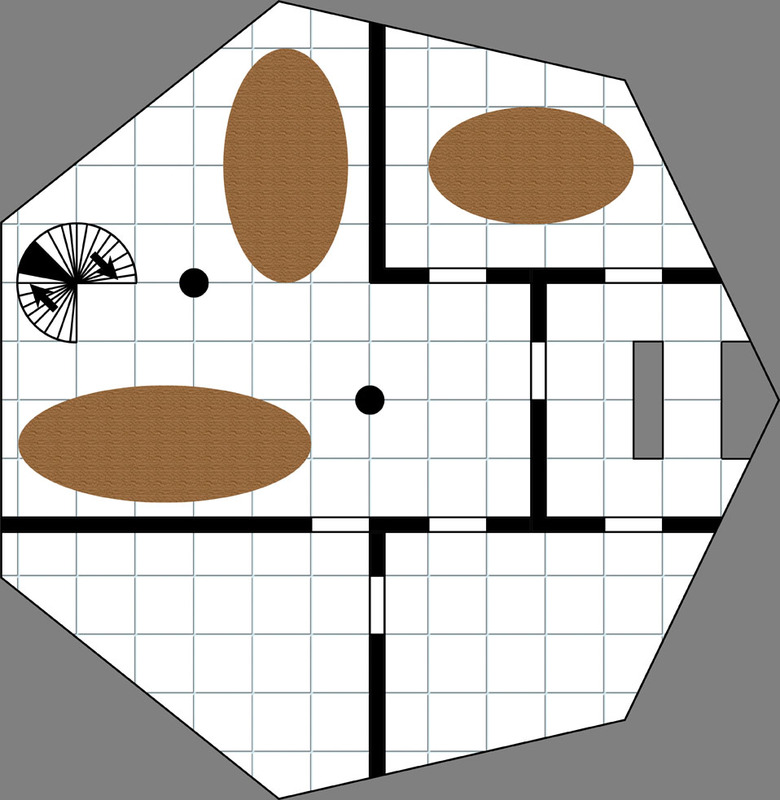 Within those rooms, which are extremely dark, the party can eventually find 10 sp worth of silver arrowheads that have outlived their steel and cold iron brethren. On a more careful search, they also find two arrowheads of a strange, dark steel (Adamantine) that have held up very well, even still holding an edge. They were placed somewhere that was likely easy to reach in the easternmost room. The room to the south was likely once a conference room, and the thick oaken table and bookshelves were sufficiently treated and varnished that they’re very rotted but still obvious in their use. The table has pitched over to the east and the side touching the floor is decaying into a wet, soft earth while the western end stays relatively free of the damp. Strangely, the “bookshelves” appear to have been designed more like honeycombs, with fist-sized tubes alternating up the length. In a few, a metal post* lies amidst decayed pulp, but if the rest of them held scrolls, their organic components have long since deteriorated beyond recognition. If there was anything else of value in this room, the previous visitors have claimed it. * The posts are just brass dowels, likely someone making a fancy scroll core instead of using a wooden dowel. The following is a short rules set I worked up for an offer from a sidhe noble in my Beyond the Wall game: when the fae really want to tempt you to do something for them, they can offer up some of their own ability scores to give yours a permanent boost. The gift tends to come with quite a bit of the resonance of the sidhe, making it a bit of a mixed blessing and pulling you closer to becoming fae yourself. Permanent ability score boosts are obviously a pretty big reward for most D&D iterations; in my game, this was the gambit for the fae asking for ownership of the ancient crown mentioned last week (which the players, some with more regret than others, passed on taking). The fae can offer up to +4 to a particular quality, such as might or beauty (noted in parenthesis and mapping to an ability score). You may choose to give the player full control over how much is taken, the faerie may only offer a point or two, or you might offer it on a sliding scale (e.g., characters starting with a low score can get a bigger boost than those with a high score already). Taking +1 has no ill effect. Characters that accept +2 gain the cosmetic side effect for the trait. Those that accept +3 gain the cosmetic and the minor side effects. Those that accept +4 gain all three side effects. If you take one less increase, you also gain the boon. Thus, if you want the boon, you could take it, no ability score increase, and no side effects all the way up to the boon, +3 to the score, and all three side effects. Boon: Weapons you wield made entirely of plants (e.g., clubs, staves, etc.) increase damage by a die size. Double your progress rate when using force to move or alter plants (e.g., blazing trails, hauling wood, etc.). Cosmetic: Your muscles creak like tree branches when exerting themselves. Minor: Treat iron as adamantine for the purposes of bending/breaking it (i.e., basically impervious to brute force). Major: Iron or steel weapons you wield are at -1 attack penalty and iron or steel armor you wear is at -1 AC (due to feeling heavier than they are). Boon: You always Pass without Trace through forest environments (includes immunity to the Hedge). Cosmetic: You exhibit unearthly thinness and a great degree of androgyny. Minor: You are helplessly immobilized when bound in iron. Major: You must save vs Spell or dance when exposed to certain music (as if Tasha’s Hideous Laughter in 5e). Boon: Double all healing (natural or magical) when outside in a natural environment, and gain +2 to saves vs. Poison from natural sources. Cosmetic: Your skin takes on the appearance of bark. Minor: You automatically hibernate when sleeping in Winter (each day you must be woken forcefully or you will sleep until Spring). Major: You suffer vulnerability to Iron. Boon: You gain your choice of either the Glamour Weaving or Second Sight cantrips (Minor Illusion cantrip or Detect Magic as ritual in 5e). Cosmetic: Flowers and vines twine through your hair while sleeping and are difficult to remove. Minor: You must save vs. Spell to refuse a riddle game (Cha save in 5e). Major: You are incapable of telling an outright falsehood (this may impose situational penalties to Deception if not well-roleplayed). Boon: You gain your choice of either the Druid’s Touch or Beast Ken cantrips (Druidcraft cantrip or Speak with Animals as ritual in 5e). Cosmetic: Your eyes and ears transform to strongly resemble those of the fae. Minor: You can be commanded by someone who knows your True Name (you may be able to save to resist commands). Major: You must save vs Magic Item or be paralyzed by sound of bells (Str save in 5e). Boon: You learn the spells Commanding Word, False Friend, Inspiration, and Word of Courage and may cast +1 spell per day (Cast your choice of Bless, Command, Charm Person, or Heroism at 1st level 1/day in 5e). Cosmetic: You take on a fae cast to your features and assume the skin and hair coloring of the donating faerie. Minor: You become a physical duplicate of the donating faerie (less any fae traits not assigned from other side effects). Major: You become unnaturally aged during the Winter, taking -1 penalties to most physical actions. Boon: Weapons you wield made entirely of ice and spell attacks you make that deal cold damage increase damage by a die size. Double your progress rate when using force to move or alter ice or snow (e.g., sculpt ice, break through ice walls, blaze snow trails, etc.). Cosmetic: Your muscles creak like stressed ice sheets when exerting themselves. Boon: You treat snow and slick ice as solid ground when you desire to do so. Boon: You take half damage from cold/ice attacks and treat temperatures down to freezing as comfortable (adjusting sub-freezing temperatures as if freezing was room temperature)(Cold Resistance in 5e). Cosmetic: Your skin takes on a bluish pallor. Minor: You automatically hibernate when sleeping in Summer (each day you must be woken forcefully or you will sleep until Autumn). Cosmetic: Frost patterns form on your skin whenever you are exposed to cold. Boon: You gain your choice of either the Blessing or Hexing cantrips (Guidance cantrip or Bane at 1st level 2/day in 5e). Boon: You learn the spells Obscurement, Petrifying Gaze, Terrifying Presence, and Whispering Wind and may cast +1 spell per day (Cast your choice of Dissonant Whispers, Fog Cloud, Hex, or Tasha’s Hideous Laughter at 1st level 1/day in 5e). Major: You become sluggish and uncomfortable during the Summer, taking -1 penalties to most physical actions.